Aperture is the adjustable size of the opening in your lens that allows light to be recorded on your camera's sensor. The aperture can be set larger or smaller depending on your needs. The larger the aperture, the more quickly light is recorded on the sensor, allowing you to shoot with faster shutter speeds. The smaller the aperture, the less quickly light is recorded on the sensor, requiring you to shoot with slower shutter speeds. Cameras measure aperture by a number called an f/stop. And unfortunately, here's where common sense comes to a screeching halt. The way f/stops are calculated, the larger the aperture, the smaller the f/stop number. So f/4 is a larger aperture than f/8. And to make matters worse, doubling the f/stop number decreases the exposure by 2 stops (1/4) instead of by 1 stop (1/2). It's good to be familiar with the following sequence of numbers. As you move from left to right in this sequence, you are decreasing your exposure by 1 stop. And as you move from right to left, you increase exposure by 1 stop. Of course, you can choose an f/stop between these numbers, but these are standard increments that will help you keep track of the changes you're making to exposure. It helps you set the shutter speed you want and maintain the exposure you need. If you need a fast shutter speed, open up your aperture to the largest possible on your lens (smallest f/stop number). If you want a slow shutter speed, stop down your aperture so that it's smaller (larger f/stop number). Many lenses will let you shoot at f/32, but be careful about going smaller than f/16--in some cameras and lenses you begin to lose some sharpness at smaller apertures than f/16. It helps you control your depth of field. We use the term "depth of field" to describe the amount of your scene that you have in focus. In other words, depth of field is the distance in front of and behind your subject that appears to be in focus. The larger your aperture (smaller f/stop), the narrower your depth of field will be--that is, it will make the area in front of and behind your subject look more blurry. The smaller your aperture (larger f/stop) the wider your depth of field will be--it will make the area in front of and behind your subject look more sharp. 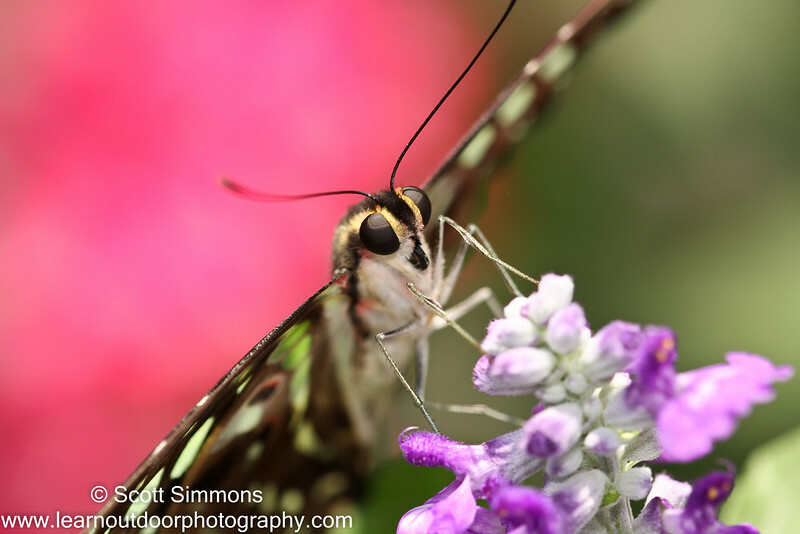 In the above photograph, I shot the butterfly at f/5, a fairly wide aperture, especially in macro photography. The result was a relatively fast shutter speed (1/250 sec) and a narrow depth of field--notice that only the butterfly's head and the front of its wings are in focus. Note: For those of you who like the math, an f/stop is the focal length of the lens divided by the size of the opening. So if a 100mm lens is set to an aperture of 50mm, the f/stop will be f/2. Change the aperture to 25mm and the f/stop is f/4. And the reason why doubling the f/stop number decreases exposure 2 stops (not 1) is because the area of a circle equals pi multiplied by the radius squared (A= πr²). So if you double r you quadruple A (the area of the aperture) as well as the amount of light hitting the sensor. The size of the aperture is increased by 1 stop every time you increase the radius by a factor of the square root of 2. Wiping your hard disk is possible using hard disk wiping software. system. We have fifteen years experience and handle 1000’s of recovery jobs every year. What Makes a Photograph "Good"
Should I Shoot RAW or JPEG Files?